Now, after 12 years of supporting Meniere's sufferers and 7 years of study and research into underlying causes and triggers of Meniere's Disease by former sufferers and health professionals, we now know that nobody has to live with this condition. You now have all of our findings recorded for you to use as a guide to living free of this horrendous condition. Bottom line? 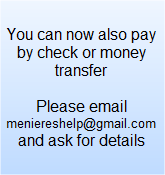 YOU DO NOT HAVE TO LIVE WITH MENIERE'S. Never let anyone tell you, "There is nothing more to be done, learn to live with it." YOU 'CAN' GET YOUR LIFE BACK. 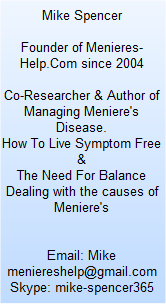 Get "Managing Meniere's Disease" now and you will get "The Need for Balance" FREE. Learn the truth of what may be behind your symptoms and what you can do about it. Learn why your doctor only treats symptoms and often ignores the facts you should know that will set you free. Discover the facts hidden in plain view and why you are not being told about them. Are you making your symptoms worse right now without even knowing it? It is time to take your health into your own hands and set yourself free of Meniere's once and for all. It can be done, it has been done and is being done all the time. This is not hype or false hope, just plain provable facts. Feel free to email us with any questions, worries or concerns. We are here to help you. "The Need For Balance" delves deeper into your root cause(s) of Meniere's and reveals some SHOCKING findings from our 7 years of study and research into underlying causes of this condition and how to deal with them.